We are centrally located in North Andover, MA and serve the North Shore, Merrimack Valley, Essex County as well as Southern New Hampshire and Maine. Initially founded in 1992 by founder Mike Winslow the company quickly found a niche for full service design, construction and landscaping solutions delivered ontime at cost effective pricing. Perennial Landscaping prides itself on providing the home owner with a variety of options based on our level of experience - and we really do understand no two jobs (or customers) are alike. Additionally, we also address the myriad of commercial applications and specifications required by today's building requirements. Call us today to learn more, or to schedule a complementary cost evaluation. Our mission is to offer top notch landscape maintenance, design and construction services in a prompt, affordable fashion. From complex installations, through fall and winter landscaping we stand ready to answer your individual requests. Perennial Landscaping is fully insured Massachusetts Landscaping company and experienced in all aspects of fulfilling your property needs. Call us today at (781) 334-3764 to learn more, or to schedule a free cost quotation. 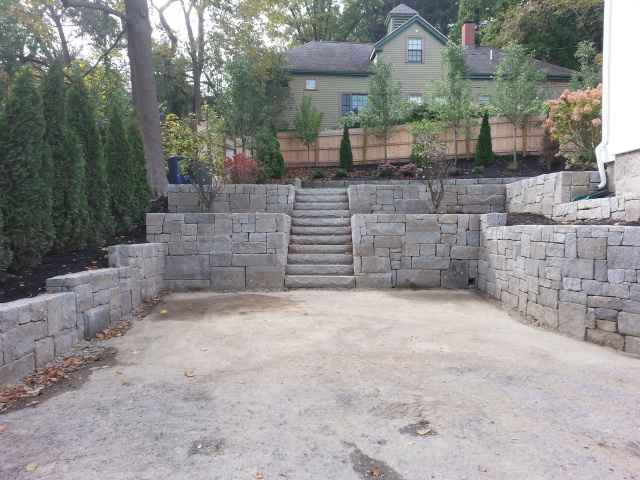 View hardscape project from begining to end.